Have a quick question? Need a price Quote? Need an Outdoor Patio Heater for you next event? Want to keep you guests warm during your event or party? 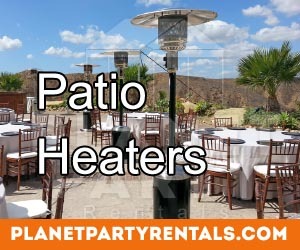 We rent patio heaters to help you with your problem. We offer affordable patio heater rentals. The patio heater rental includes the outdoor patio heater itself and a tank of propane gas. If you do not know how to use a patio heater, we will show you how to use one. We will give you a quick tutorial as well as instructions on how to turn on our patio heaters. Don't keep your guests suffering the cold weather, rent a patio heater for your next event, wedding, baptism, xv, sweet 16, or any other event today. We cover the entire San Fernando Valley, Calabsas, Simi Valley and Santa Clarita.